Offering stylish, modern apartments within minutes of Mooloolaba and Alex Beach, Alexandra on the Pacific is home to a great range of onsite facilities and is close to popular local activities and attractions including Underwater World. Enjoying open plan designs and private balconies, each apartment enjoys views of the beach, ocean and Glasshouse Mountains. Just 15 minutes from the airport, the resort is also within walking distance of shops, surf clubs, cafes and restaurants. Located opposite Alex Beach, just across from Alexandra Headland, Alexandria Apartments offer spacious, self-catering holiday apartment accommodation conveniently situated between Mooloolaba and Maroochydore. Ideal for couples and families, the resort is set on one of the best surf beaches on the Sunshine Coast and is within walking distance of a variety of local shopping, dining and surf clubs. Enjoying north-facing views of the ocean and beach, the resort is home to a great range of onsite facilities and offers everything you need within easy reach. Located opposite one of the Sunshine Coast's most popular beaches, BreakFree Alexandra Beach offers modern accommodation designed around a beautiful tropical lagoon-style pool. The resort is also home to a fantastic range of facilities including a heated pool, spa, two waterslides, a rapids section and a pontoon close to a number of local activities and attractions. 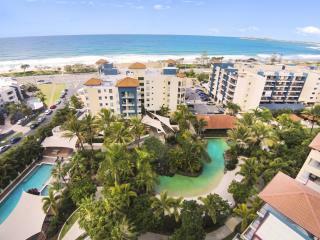 Situated within 1km of central Mooloolaba, Grand Palais Beachside Resort offers well-appointed studio and apartment accommodation boasting views of Alexandra Headland. Located just 50m from the famous Bluffs surf break, the resort is also only 30m from the popular patrolled Alex Beach. Home to a convenient range of onsite facilities, the resort is just a short drive from the Sunshine Coast Airport and Maroochydore. Surrounded by an outstanding range of local shopping, dining, entertainment and activities, the resort is close to popular attractions such as the Headland Golf Course, Sunshine Plaza and Australia Zoo. Located within walking distance of Alexandra Headland's most popular surf beach, Oaks Seaforth Resort offers stylish accommodation with picturesque views of the Pacific Ocean. The resort is conveniently close to a number of Sunshine Coast tourist attractions and enjoys an impressive range of onsite facilities including lagoon swimming pool, a children's wading pool and a tour desk. Located just 150m from a patrolled surf beach, The Mirage Alexandra Headland offers stylish holiday apartment accommodation overlooking Lake Nelson Park. Home to a great range of onsite facilities, the family-friendly resort is just 15 minutes from the airport and is close to a variety of local shopping, dining, activities and attractions. Enjoying scenic views of the ocean and the lake, the resort is conveniently located right off the main road but is protected from traffic noise.